“UN peacekeeping operates in increasingly complex environments and we are grateful for steadfast partners like India, who have risen to new challenges and continue to participate meaningfully in our efforts to protect vulnerable civilians,” the Under-Secretary-General for Peacekeeping Operations, Jean-Pierre Lacroix, said in a recent interview with UN News. Mr. Lacroix visited India in June as part of a wider trip to the sub-region during which he thanked the Government and people of India, as well as Bangladesh, Nepal and Pakistan, for their service and sacrifice in the name of peace. Together, troops and police from the four countries currently make up close to one-third of some 91,000 uniformed personnel across 14 UN peacekeeping operations. Commencing with its participation in the UN operation in Korea in 1950, India has a long and distinguished history of service in UN peacekeeping, having contributed more personnel than any other country, as well as the first-ever all-female force that helped to bring peace to Liberia in the wake of that country’s brutal civil war. From 2007-2016, there were nine rotations of all-female police units from India, whose primary responsibilities were to provide 24-hour guard duty, public order management and conduct night patrols in and around the capital, Monrovia, while assisting to build the capacity of local security institutions. Hailed as role models, these female officers not only played a vital role in restoring security in the West African nation but also contributed to an increase in the number of women in the country’s security sector. “The contribution you have made to inspiring Liberian women, to imparting in them the spirit of professionalism, to encourage them to join those entities, those operations that protect the nation, for that we will always be grateful,” then President Ellen Johnson Sirleaf stated when the last all-female unit departed Liberia in February 2016. 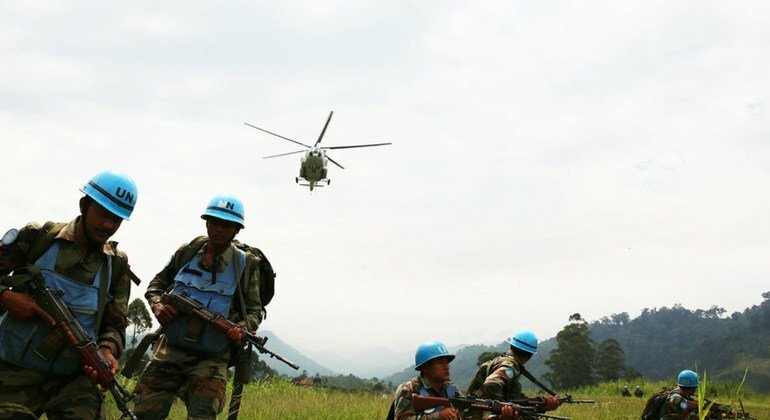 Indian peacekeepers in the Democratic Republic of the Congo secure a helicopter landing site in the far east of the country in 2015. In addition to their security role, the members of the female Indian Formed Police Unit also distinguished themselves through humanitarian service, including organizing medical camps for Liberians, many of whom have limited access to health care services. Medical care is among the many services Indian peacekeepers provide to the communities in which they serve on behalf of the Organization. They also perform specialized tasks such as veterinary support and engineering services. Indian veterinarians serving with the UN Mission in South Sudan (UNMISS), for example, stepped up to help cattle herders who were losing much of their stock to malnutrition and disease in the war-torn nation. In South Sudan, cattle are not only a valuable source of food but also a commodity for bartering. The Indian veterinarians ran a mobile clinic earlier this year, travelling across the Upper Nile region, including to remote and dangerous locations, to treat sick cattle and educate their owners about disease prevention. “Wherever I went I was being welcomed by people. They were very happy because there was no one, no one to look after them and whatever little we could contribute as a veterinarian and part of UNMISS, it is beneficial for them and for the animals,” said Indian peacekeeper and veterinarian Prashant Tripathi. The Indian contingent in the Upper Nile region includes the Indian Battalion, the Horizontal Mechanical Engineering Company, the Level II hospital, the Petroleum Platoon and the Force Signal Unit. They have all received UN medals of honour for their dedication and service in peacekeeping. The Indian contingent in South Sudan has gone the extra mile by providing vocational training and life-saving medical assistance, as well as carrying out significant road repair work. 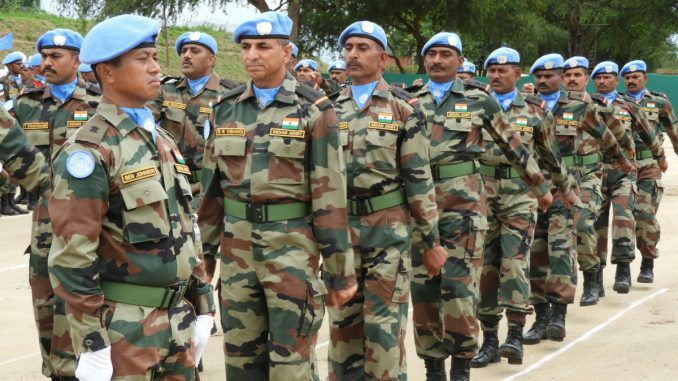 India’s longstanding service has not come without cost; as of 30 June 2018, over 160 Indian peacekeepers have paid the ultimate price while serving with the United Nations. “India has lost more peacekeepers than any other Member State. We grieve with the families and the people and Government of India for these losses,” noted Under-Secretary-General Lacroix.